Today is my daughter’s 9th birthday. She brings us such joy! She is our little ray of light (her middle name means that). She’s fun and quirky and has so much love and empathy in her heart. To celebrate her birthday and my “birthing day”, we both went shopping with her grandma Jan at the Glitter after hours shopping night at Lawson Heights Mall. Grandma bought her some books she’s been wanting and some necklaces. And I found some fantastic deals – a pair of red boots which I love (an early birthday present from grandma Jan) and two sweaters. 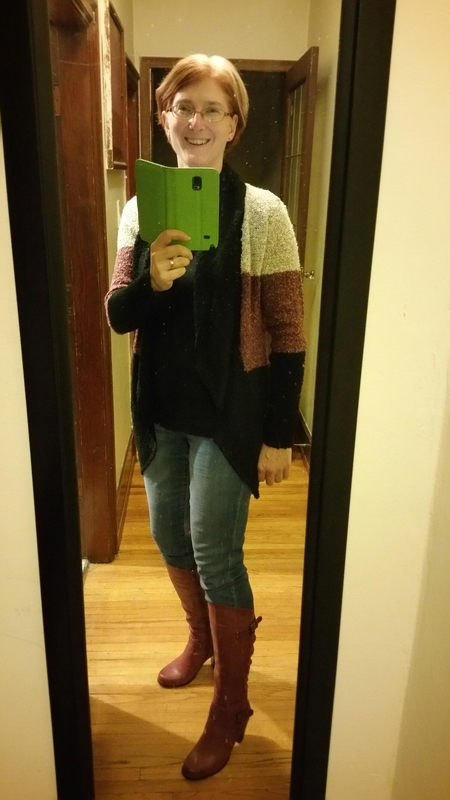 Here’s me with my boots and one of my sweaters. I don’t go shopping for myself very often and there are many times when I’m trying to find something specific and I can’t find it (which is so frustrating). But the most fun I have is when I’m not looking for anything in particular and then I come across things I like AND they’re on sale. What fun!